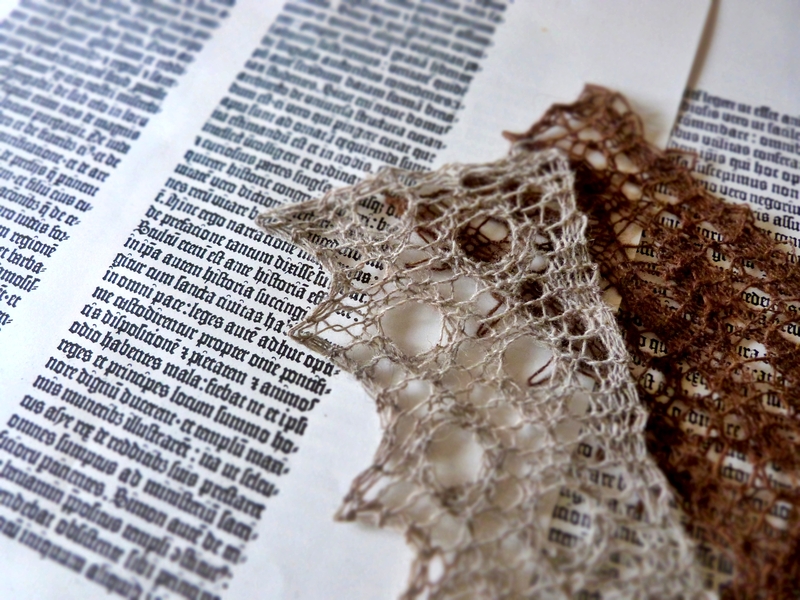 As a philologist* and knitter, I was honoured when Karie Westermann invited me to participate in a blog tour to introduce This Thing of Paper. Karie is a knitting designer whose work I’ve admired for numerous years, not just because of the beauty in her patterns but because her designs inspire me to revisit the familiar with new eyes, like A.S. Byatt’s novels, or explore new areas, like the interplay between the landscape, materials and tools of Mesolithic Doggerland. Her latest project is no different! 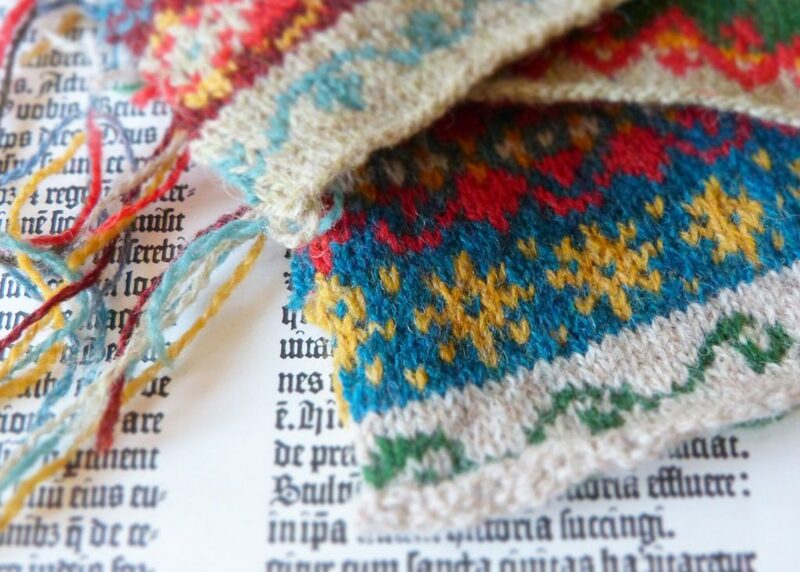 This Thing of Paper is a collection of ten knitting patterns and accompanying essays inspired by Johannes Gutenberg and the invention of the printing press. 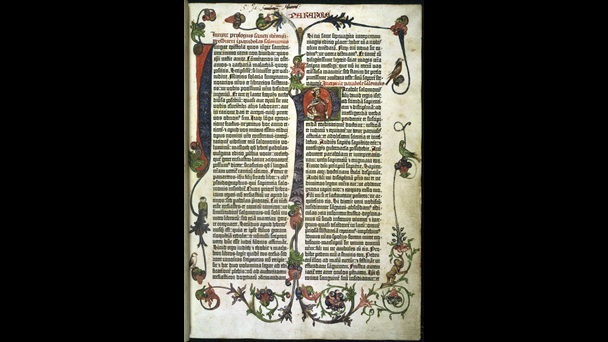 Gutenberg was a pivotal figure in human and social history as his invention meant a shift from illuminated manuscript, which were the preserve of monasteries and chanceries, to texts that could be “mass produced”. 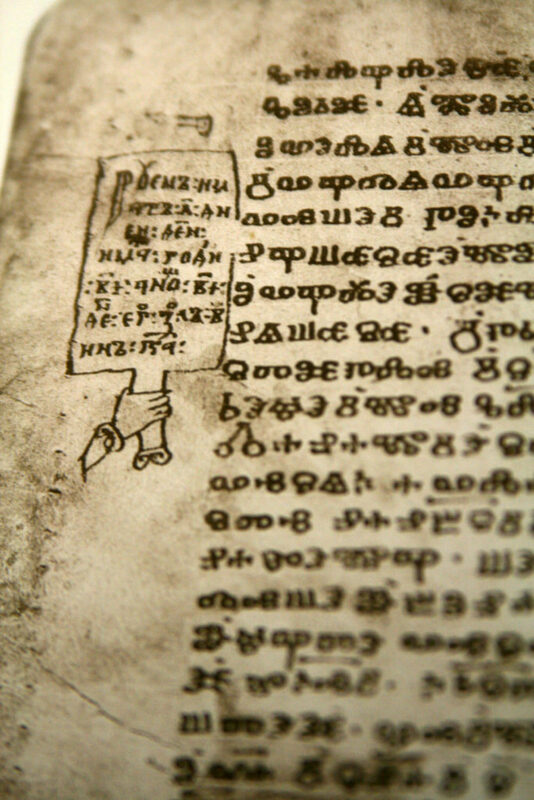 His invention played a major role in democratising reading, as the 16th century embroidery manual Karie consulted for her research illustrates. Books from the late middle ages and early modern era may sound like a dry source of inspiration to some but from my own years of pouring over reproductions of Glagolitic and Old Slavonic manuscripts and Old Croatian and Old Russian volumes, I can testify to the beauty, artistry and humour that can be found in the lay-out and margins of parchment and paper! Although Karie is inspired by five to seven hundred year-old sources, this will not be a collection of wimples, kirtles and hose but a thoroughly contemporary set of accessories and garments. Those who know this designer’s work will be familiar with her talent for taking art, literature, architecture, archaeology… and translating them into design elements that are not only beautiful in their own right but invite knitters to go on their own journey and tell stories unique to them (as with my Generous Visitor shawl). And those who have yet to discover Karie’s design aesthetic have a real treat in store! Unlike her previous collections, such as Doggerland (which summons up the landscape and artefacts of a submerged land through yarn and stitches) or Authors and Artists (a homage to female voices), Karie plans to publish This Thing of Paper as a physical book. After all, a volume inspired by the famous printing press could hardly remain digital only! To this end she launched a Kickstarter campaign on 23 May to crowdfund the production and publication of This Thing of Paper. The Gutenberg inspired book has captured the imagination of knitters and book lovers alike, so much so that it reached its target in barely 25 hours and is currently 140% funded! If this remarkable project appeals to you, you can still pledge your support for This Thing of Paper here. 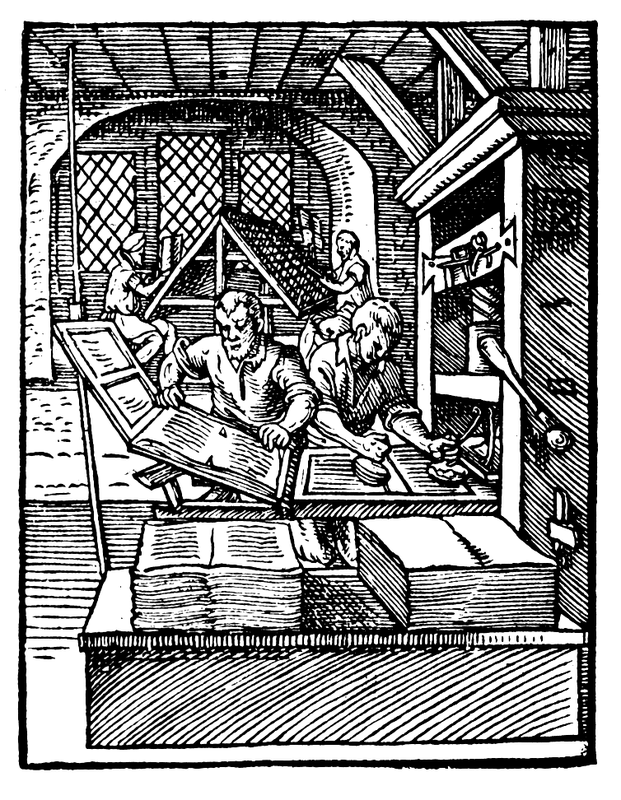 As bibliophiles and linguists Karie and I are obviously beneficiaries of Gutenberg’s legacy, but so is anybody who reads, writes, enjoys a good novel, produces reports for work, browses the Internet… Near universal literacy and daily access to the written word would not have been possible were it not for Gutenberg’s vision of a tool that could reproduce pages quickly. How glorious that nearly six centuries later, another communication tool will allow this pivotal invention to be celebrated in the hands of knitters via a beautiful volume envisioned by a remarkable, bookish designer! This is one of a dozen stops on Karie Westermann’s blog tour. Thank you Naomi Parkhurst of Gannet Designs for signposting readers to my instalment. Naomi explores stitch patterns in her Etudes and has designed a new stitch pattern inspired by This Thing of Paper! The next stage is provided by Natalie Servant, a knitting designer whose lace work is inspired by Art Deco and architecture. I am including the full list of the blog tour below in case you’d like to read how an eclectic mix of designers, knitters, bibliophiles, linguists, (sound) artists… are interpreting and responding to this remarkable book concept. 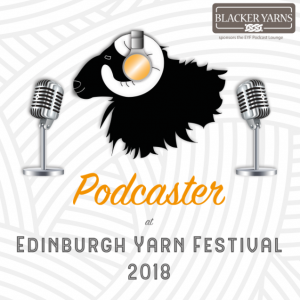 You’ll also be able to hear Karie talk about her project with Louise Scollay in the next episode of the Knit British podcast on Tuesday 31 May. * A philologist is literally a lover of the word but academically means a student of languages, more specifically of the development and relationship of languages from a particular language group. In keeping with my standard policy, I have not been sponsored or received any inducement for this post. In fact, I couldn’t wait for this crowdfunder to go live so I could contribute to the publication of This Thing of Paper!